Dementia is the first comprehensive treatment of neuropsychiatric approaches to both onset and treatment of the major dementias. Within these three volumes, leading experts on brain science and research explain details, developments, and emerging treatments for one of the most widespread, devastating disorders world wide dementia. 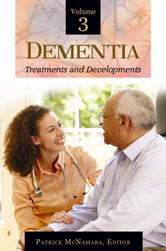 This title provides mechanistic accounts of dementia onset that take into account neuropsychiatric disorders of dementia and reviews of the latest treatments for both patient and caregivers.